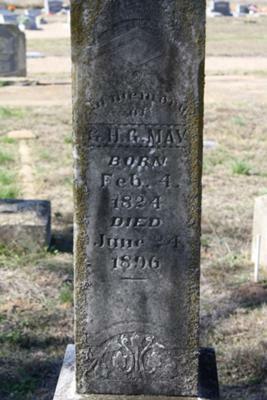 My Great-great-great grandfather's headstone in Wrightsboro Cemetery Wrightsboro, TX. Not sure if you can tell me anything about the marker or the local lodge, but the historical marker in town reads, "Local Masonic Lodge, Shuler No. 317, has operated from 1869 to 1915 and 1920 to the present". I took the liberty of cropping and enlarging your photo a bit so everyone could see the engraving on the , better. It is, indeed, old, judging by the moss clinging to it. Since all that I could read on the stone was your great-great-great grandfather's name and his birth date February 4, 1824 and date of death, June 24, 1896, I really can't tell you very much, except that I checked the Grand Lodge's website lodge locator page and Shuler Lodge # 317 is not listed. I would assume from this that the lodge is no longer an active lodge, however, if you contact the Grand Lodge of Texas, they may or may not be able to tell you a little more about your great-great-great grandfather's role in the lodge. Keep in mind, however, that these records are probably not in their current computer database. They are, most likely archived, possibly in paper form or on microfiche. But, it doesn't hurt to ask. Some Grand Lodges have been trying to go through the old archives and place the information in the computer, but, 100 years worth of members is a lot, and, rarely is there a reasonable use/benefit for the data, considering the fact that salaried employees would be the ones to have to input it. Thanks for sharing this old Masonic gravestone with everyone, Michael. Oh...one more thing...I did a Google search and found a short blurb in Google Books that Shuler 317 lodge was held at the Magnolia Church.